The beauty of an orchestra is formed not only through the dedication of its members, but the forging of its instruments. Ductility—the ability to be shaped without losing strength—is essential to shaping the trumpet and horn that praise God in Psalm 98. Ductile trumpets are of brass: they are drawn out by hammering. 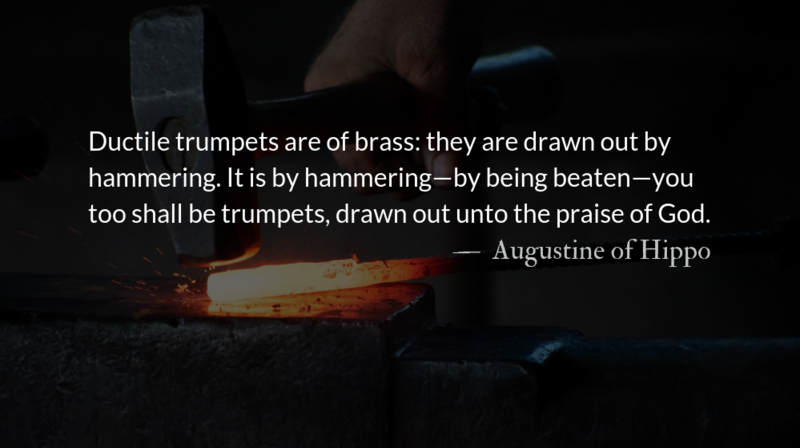 It is by hammering—by being beaten—you too shall be trumpets, drawn out unto the praise of God. You improve when in tribulation: tribulation is hammering, improvement is the being drawn out. This ductile trumpet is still under the hammer. We have heard how he was drawn out; let us hear how Job sounded: “What! shall we receive good at the hand of God, and shall we not receive evil?” O courageous, O sweet sound! Whom will that sound not awake from sleep? Whom will confidence in God not awake—to march to battle fearlessly against the devil; not to struggle with his own strength, but His who proves him. There is a deep richness that comes to people who face suffering biblically. A key to this richness is a joy and a contentment that difficult experiences cannot steal. John is direct with his readers—it is not our goal to get the world to like us. In fact, we should not be surprised when they hate us. Though a beloved author now, Madeleine L’Engle experienced what John meant and she might have added that we can’t even guarantee that other Christians will like us.